During October, Oxbow Cheese & Wine Merchant is featuring a brand new cheese, Bishop’s Peak, from the Central Coast Creamery in Paso Robles. Owner, operator and cheesemaker Reggie Jones began his career in cheese doing product development and quality control, and dreamed of one day creating his own small-batch artisan cheeses. Jones and his wife now specialize in making aged cow, goat and sheep’s milk cheeses, produced from local, hormone-free milk. Jones believes in the rich potential of high quality milk, and has a mission to introduce the American palate to flavors found in the best cheeses of Europe. 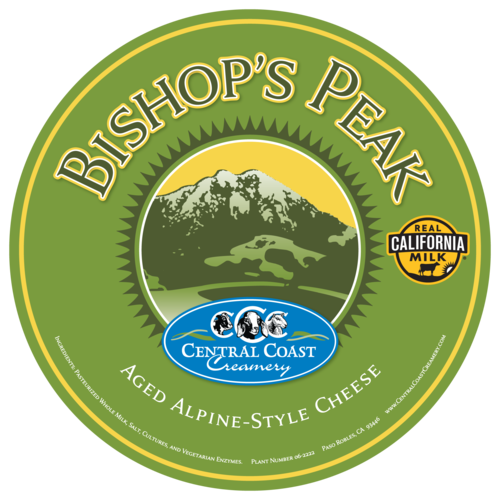 Named for a popular Central Coast landmark, Bishop’s Peak is Jones’ take on the famed traditional cheeses of the European Alps. 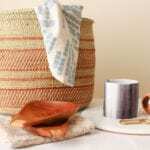 It is made strictly from the milk of cows at the Cuyama Dairy, which has been in business for over 60 years and is the last dairy in Santa Barbara County. The cow’s grass and high carrot diet gives the cheese a distinct yellow paste, and flavors that range from sweet to earthy. Its sweet, caramel flavors and creamy mouthfeel make this cheese an instant crowd pleaser. 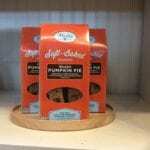 Try melted on a hot sandwich or grilled cheese, or just out on a cheese board for hors d’oeuvres. Stop by the cheese counter and ask a staff member for a taste! While you’re there don’t forget to look at some of Central Coast Creamery’s other great cheeses like Holey Cow and Seascape.